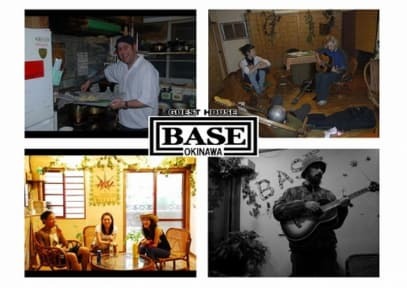 Base Okinawa is an affordable guest house conveniently located in the heart of Naha-city. It is only a minute walk to the Naminoue Beach. You can also walk to Naha's main street. 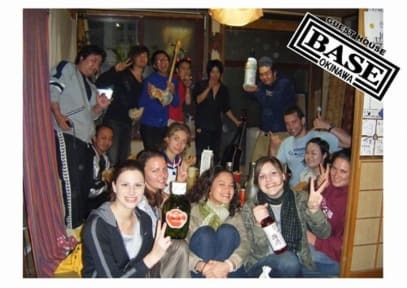 Which is Kokusai Street where numerous souvenir shops, restaurants and bars can be found. It is an ideal location for tour and shopping! We have both private rooms and dormitory type rooms. Private rooms are air-conditioned and equipped with shower and toilet . Dormitory type rooms are also air-conditoned and equipped with shower and toilert. Dormitory beds are bunk beds. Dormitories are separated by gender. About 15 minutes walk from Yui Rails Kenchomae Station. About 5 minutes walk from Kume Yubinkyokumae Bus Stop. Walk for about 15 minutes towards Naminoue Beach. Pass Lawson and Fukushyu Garden (Fukuhshyuu-en), then cross a wide road (Wakahsa Ohdouri) and when you get to the corner of Mai Mart turn left. Walk for about 1 minute and you will see the pink facade of Base Okinawa. Its a 5km ride that will cost you approximately 1,200yen. Tell the driver to go to: Wakasa Ichoume 17-5. Tsushima maruki nenkan ka Naminoue beechi Atari. Go from NahaKookoh-mae to Kume Yuubin Kyoku mae. When you get off you will see a wide road (Wakasa Ohdouri) and when you get to the corner of Mai Mart turn left. Walk for about 1 minute and you will see the pink facade of Base Okinawa. Its a 4km ride that will cost you approximately 700. Tell the driver to go to: Wakasa Ichoume 17-5. Tsushima maruki nenkan ka Naminoue beechi Atari. Take a bus to Kume Yuubin Kyoku mae. When you get off you will see a wide road (Wakasa Ohdouri) and when you get to the corner of Mai Mart turn left. Walk for about 1 minute and you will see the pink facade of Base Okinawa. Click here for an easy explanation. Its a 5km ride that will cost you approximately 600. Tell the driver to go to: Wakasa Ichoume 17-5. Tsushima maruki nenkan ka Naminoue beechi Atari.